Japanese Episode 271: "Bashaamo Futatabi! Hazuki to no Tatakai!!" English Episode 609: "Playing with Fire!" After defeating Shigeru in the Silver Conference, Satoshi immediately finds himself faced against Hazuki from Mishiro Town. The first battle pits Kakuleon against Pikachu, who grabs onto the chameleon pokemon's tongue to deliver a devastating electrical attack. Hazuki then sends out his Nyuura, whose Iron Claw quickly KO's the electric mouse pokemon. 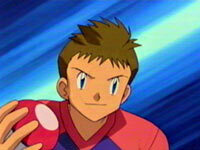 Satoshi sends out his Waninoko, whose combination of dancing and biting defeats Hazuki's pokemon. Hazuki's third pokemon is a Sleeper, the hypnosis pokemon. Sleeper hypnotizes Waninoko and throws it around the ring, giving Hazuki a quick victory. Satoshi responds with his Kabigon, but the pokemon comes out sleeping! After Sleeper's Dream Eater attack awakens Kabigon, the grumpy pokemon uses a Hyper Beam to knock its opponent out. With both trainers down to three pokemon apiece, the trainers are given a short break to think out future strategies. After the break, Hazuki sends out Haganeeru while Satoshi sends out Yorunozuku. The owl pokemon starts off strongly, but it's defeated by Haganeeru's relentless series of attacks. Satoshi brings his Kabigon back out and orders it to Ice Punch its way toward victory. Next, Hazuki calls on his Herugaa, who Counters Kabigon's Hyper Beam right back at it, defeating the massive pokemon. To everyone's surprise, Satoshi's next choice is his Bayleef. Despite the type disadvantage, Satoshi finds a way to win by using Bayleef's vines like a muzzle to clamp Herugaa's mouth shut, preventing it from using its fire attacks. Hazuki's final pokemon, not surprisingly, is his Bashamo. Bashamo quickly defeats the grass-type, prompting Satoshi to send out his final pokemon--Lizardon. Now, Lizardon faces Bashamo--who will come out on top? To be continued!! I really didn't like the last episode's battle because it was too choppy and extremely anticlimatic. But with Satoshi's battle against Hazuki, the anime producers have allowed the two more time to battle, and the result is a battle that flows much more naturally. No über-impossible battle techniques (though I'm still wondering how a Dig attack had any effect on Yorunozuku), no quick one-hit KO's, none of that mess--just a series of battles between two pretty-evenly matched trainers. Not too much to complain about here, nosiree. On the dub side...another edit-free episode. In addition, 4Kids even kept the majority of the original music intact, so that was a nice treat. The only dub thing that bothered me was one of the narrator's lines at the very beginning: "Harrison comes to the tournament with pokemon Ash has never seen before!" Um...Satoshi has seen every pokemon Hazuki battled with at the tournament...They also messed up on one of the attacks, calling Steelix's Bind attack against Snorlax "Wrap."